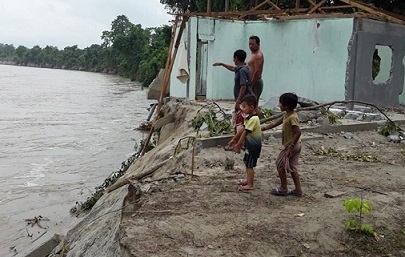 Concerned with the unprecedented situation in the Siang River basin where certain areas are facing drought like situation while others are reeling under flood, Arunachal Pradesh chief minister Pema Khandu on Tuesday drew the attention of the Union Home Ministry towards it. In a letter to Union Home Minister Rajnath Singh, Khandu called for an Inter-Ministerial team to assess the situation for further needful action and precautionary measures. Khandu informed the Union Home Minister about the reports of the Siang River flowing above the danger level. He said many houses have been eroded and washed out under the impact of gushing flood water. The sudden rise in the water level and muddy water flowing in the river is causing concern amongst the locals, he added. In a contrasting development, the chief minister said, many areas of Namsing, Mer, Gadum, Gadum-II, Kongkul and Seram Villages of Namsing Circle under Mebo Sub-Division of East Siang District, areas of Siang, Upper Siang and parts of Lower Dibang Valley districts are under drought like situation causing untold miseries including loss of crops. He requested the Home Ministry to depute an Inter-Ministerial team to visit the flood and drought affected areas of the state for a clearer picture to take up remedial measures immediately.